Cell-mediated immunity is considered critical for the prevention and control of many viral infections [1–6]. The approaches developed to detect these responses in vitro have evolved over the years and have provided quantitative and qualitative information on virus-specific T cells for a number of viral infections. These assays include, besides others, lymphoproliferative assays using 3H-thymidine incorporation or CFSE staining, limiting dilution precursor-frequency assays for the enumeration of CTL precursor frequencies, intracellular cytokine staining (ICS) and enzyme-linked immunospot (ELISpot) assays [7–10]. Although these assays differ in their minimal cell requirements, the detailed, simultaneous analysis of anti-viral immunity against multiple viral infections is often limited by cell availability, regardless of the assay employed. The ELISpot assay has become widely used for rapidly assessing cellular immune responses to extensive numbers of antigens while using relatively few cells. A number of studies have also employed peptide matrix approaches, where every antigenic peptide is tested in two peptide pools, so that responses to reactive pools sharing a specific peptide can help to identify the targeted peptide [9, 11]. This has reduced the required cell numbers significantly, so that for instance HIV-specific responses can generally be comprehensively assessed using less than 15 × l06 cells . However, despite such advances, the simultaneous enumeration of virus-specific immunity to multiple viral infections still exceeds the required sample size that can routinely be obtained. Sample size may not be of great concern when assessing CTL mediated immune responses against single, small genome viruses such as HIV and HCV, which can be tested in a comprehensive manner using overlapping peptide sets spanning the entire expressed viral genome [9, 12]. Nevertheless, such comprehensive approaches are not feasible for larger viruses, such as DNA-based herpesviruses like EBV, CMV and KSHV [4, 13]. Instead, immune analyses need either to be restricted to a selected number of specific viral proteins, or to the use of previously defined, optimal CTL epitopes. Responses against such optimally defined epitopes can account for a significant part of the total virus-specific immune responses, especially when they represent immunodominant epitopes covering the most immunogenic proteins of specific viral genomes. For well-studied viruses such as HIV, HCV, EBV and CMV, large sets of such optimally defined CTL epitopes, restricted by common HLA alleles, have been described in the past [14–17], and provide a valuable alternative to measure pathogen-specific CTL responses without the need to synthesize comprehensive peptide sets spanning the entire viral genomes. The present study describes an algorithm by which matrices of optimally defined CTL epitopes derived from five different human viral infections are used in the same ELISpot assay. As not all wells of the ELISpot plate contain antigens to which the tested PBMCs will respond, there are consistently some wells with cells that have not been stimulated during this first assay. Theoretically, these cells could be recovered from the ELISpot plate before developing it and re-used in subsequent analyses. Indeed, others have suggested the use of "recycled" cells for DNA isolation, however, to our knowledge, no data exist on re-using these cells in functional assays. Since the peptide matrix approach is ideally followed by the subsequent confirmation of single targeted peptides present in two corresponding peptide pools, recycled cells from unstimulated ELISpot wells could be used for these assays. Although this second step could be achieved using in vitro expanded cells, for instance by anti-CD3 monoclonal antibody (mAb) stimulation, expanded cells may lose some of the responses compared directly to cells tested ex vivo [19, 20]. In addition, the absolute and relative magnitude of responses may be distorted during cell expansion and assays can only be run after prolonged in vitro culture[21, 22] Therefore, as long as functionality of recycled cells in secondary assays can be ensured, they may provide a simple way to complete initial ELISpot screenings, yielding reliable information on the magnitude of specific CTL responses. The feasibility of this approach was tested and it was shown that combined use of optimal epitope matrices, in vitro T cell expansion and RecycleSpot can provide relevant immune data on multiple viral infections even when cell availability is severely limited. Whole blood was collected using Citrate Vacutainer tubes (BD, Franklin Lakes, NJ) and peripheral blood mononuclear cells (PBMC) were isolated by Histopaque (Histopaque® 1077, Sigma, St. Louis, MO) density centrifugation as described . Fresh PBMC were either used directly after isolation, after in vitro expansion or after freezing and thawing with and without subsequent in vitro expansion. For in vitro use, cells were re-suspended in R10 medium (RPMI 1640 containg 10% heat inactivated FCS (both Sigma), 2 mM L-glutamine, 50 U/ml penicillin, 50 μg/ml streptomucin and 10 mM HEPES (all Mediatech, Hemdon, VA)) at a concentration of 1 × 106 cells/ml. Cells were thawed using R10 medium containing 50 U/ml DNAse (Deoxyribnuclease I, RNase-free, Sigma), washed twice in the same medium, re-suspended in R10 and incubated at 37°C with 5% CO2 for 3–4 hours before they were counted and re-suspended in R10 at 1 × 106 cells/ml. The thawed cells were then either used directly in ELISpot assays or expanded. For in vitro expansion, 1 to 5 × 106 PBMC were added to 25 ml culture flasks in 10 ml R10 supplemented with 1 μl of the anti-CD3 specific monoclonal antibody (mAb) 12F6 . Cells were fed twice a week using R10 supplemented with 50 U/ml of recombinant Interleukin 2 (IL-2) for 2 weeks. Before use in ELISpot assays, cells were washed twice in R10 medium and incubated overnight at 37°C with 5% CO2 in the absence of IL-2. This overnight starving step was necessary to eliminate background in the subseqnet ELISpot assay, which was, in our hands, not an issue, regardless of how long the in vitro culture had been maintained. A total of 416 optimal epitopes from five different viruses were assembled in 98 different peptide pools and used in 5 peptide matrices each containing peptides from a single virus. The number of pools and total number of peptides contained in each virus-specific peptide matrix are summarized in Table 1. Each peptide was present at a final concentration of 200 μg/ml in the peptide pools. Detailed lists of all optimal epitopes included in this study, along with their sequence and HLA restriction, are given in Tables 2 through 6. All epitopes were referred from the Los Alamos HIV Immunology Database 2004 . 96-well polyvinylidene plates (Millipore, Bedford, MA), pre-coated overnight with 2 μg/ml of anti-interferon gamma (IFN-γ) mAb 1-D1K (Mabtech, Stockholm, Sweden), were washed six times with sterile phosphate buffered saline (DPBS, no Ca & Mg, Mediatech) containing 1% fetal calf serum (FCS) before use. After washing, 30 μl of R10 were added to each well to avoid drying of the membrane, and 100,000 to 200,00 cells per well were added in 100 μl R10. 100,00 cells/well were used to detect responses to HIV, CMV and EBV, whereas responses to HCV and HBV were tested using 200,000 cells/well. Each peptide was added at a final concentration of 14 μg/ml (both single peptides as well as pools). As a negative control, cells were incubated in medium alone, and PHA was added at a concentration of 1.8 μg/ml to serve as a positive control. Plates were incubated for 16 h at 37°C with 5% CO2 before being developed. After washing six times with PBS, 100 μl of biotinylated anti-IFN-γ mAB 7-B6-1 (0.5 μg/ml, Mabtech) were added and plates were incubated for 1 hour at room temperature (RT). The plates were washed again and incubated with a 1:2000 dilution of streptavidin-coupled alkaline phosphatase (Streptavidin-ALP-PQ Mabtech) for 1 hour at RT in the dark. After washing the plates again, IFN-γ production was detected as dark spots after a short incubation of 10–20 minutes with nitroblue tetrazolium and 5-bromo-4-chloro-3-indolyl phosphate (BioRad, Hercules, CA). The color reaction was stopped by washing plates with tap water and the plates were air-dried before counting using a AID ELISPOT Reader Unit (Autoimmun Diagnostika GmbH, Strassberg, Germany). Results were expressed as spot forming cells (SFC) per million input cells. Thresholds for positive responses were determined as either 5 spots (50 SFC/106 input cells) or as the mean plus 3 standard deviations of negative control wells, whichever was higher. After overnight incubation in a primary ELISpot assay, cells from all wells of the ELISpot plate were transferred to a 96-well round-bottom plate and incubated at 37°C with 5% CO2 while developing the ELISpot assay. Cells from wells without any spots (including negative control wells) were then pooled, counted and used for secondary ELISpot assays. In control experiments, cells corresponding to wells with positive responses were also pooled, washed extensively (>5 times) and re-used in subsequent, secondary ELISpot assays as well. Cells from positive control wells (PHA stimulated) were not used for subsequent assays. To simultaneously test CTL responses against five different viruses with a limited number of PBMCs, a peptide matrix approach was used that included all previously published, well-defined CTL epitopes in HIV, HCV, HBV, EBV and CMV. The total number of described CTL epitopes for these viruses varied from 37 described optimal epitopes in HBV to more than 170 optimal epitopes in HIV. A list of all the optimal epitopes included in the present study is given in Tables 2 through 6, totaling 416 well-defined, HLA class I-restricted CTL epitopes. The included HIV epitopes were derived from the annually updated list of HIV CTL epitopes at the Los Alamos National Laboratory HIV immunology database. For all the other pathogens, the epitopes listed were those for which, to the best of our knowledge, at least one publication existed showing CTL activity against this epitope in at least one infected individual. While the optimal epitopes in HIV, HCV and HBV cover large parts of their respective viral genomes, the epitopes defined in EBV and CMV represent only a portion of the proteins expressed by these viruses. Given the approximately 100 open reading frames in these large-genome viruses, complete representation of all viral proteins can hardly be achieved and most studies on these pathogens have thus focused on a relatively small number of viral proteins, especially concentrating on those containing serological determinants and those characterized by specific viral gene expression patterns. Thus, described EBV and CMV encoded CTL epitopes are derived from eleven and four different viral proteins respectively, whereas the known HIV, HCV and HBV epitopes cover all the viral proteins in these small-genome pathogens. As the number of described optimal CTL epitopes varies between pathogens, separate peptide matrices were designed for each virus (Table 1). Importantly, the first set of pools ("protein pools") was designed so that the pools contained all the epitopes derived from the same viral protein, whereas the second half of matrix peptide pools contained the epitopes in a non-protein specific composition ("random pools"). This matrix design allowed assessment of the virus specific immune response at different levels of resolution including i) a "total virus" specific response by adding up all the protein pool specific or random peptide pool specific responses, ii) a "protein" specific responses by focusing on single pools containing all the epitopes of a given protein; and iii) upon single peptide confirmation, on a single epitope level, by comparing responses in pools containing the same epitope. Together, the epitope matrix design facilitated the assessment of T cell responses to more than 400 CTL epitopes from five different viruses simultaneously, using less than 10 × 106 PBMCs while still allowing determination of breadth and magnitude of virus-, protein-, and epitope-specific responses for each virus separately. Moreover, since each epitope is tested twice in different pools, it should reflect the same magnitude of response in each pool, thus the matrix approach provides its own internal control. Additionally, "protein pools" and "random pools" should theoretically yield the same total magnitude of responses since they, as a whole, contain the same set of peptides. 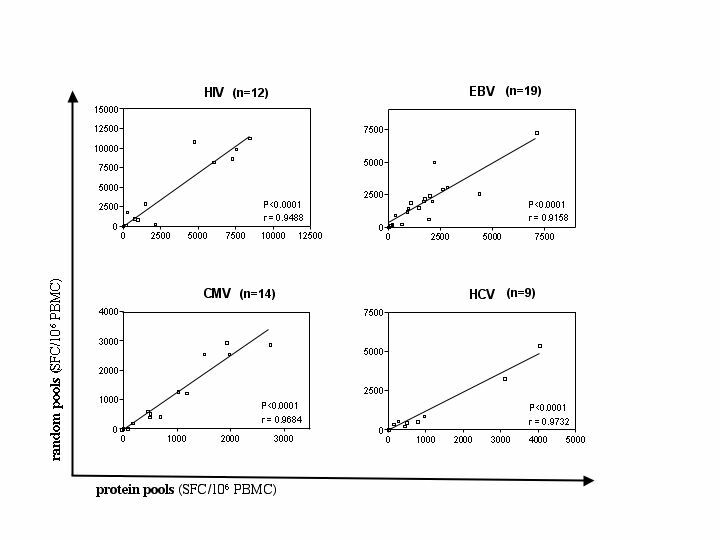 To test this, and rule out the possibility that peptide compositions in the different pools interfered with the detection of specific responses, the magnitude of all "protein pool" and "random pool" specific responses were compared in 19 subjects infected with EBV (n = 19) and co-infected with CMV (n = 14), HIV (12), and HCV (9). These analyses showed a statistically highly significant correlation between total magnitudes of responses detected by either set of peptide pools, indicating that the peptide mixtures in the pools sharing a specific response did not significantly impact the detection of the targeted epitope (Figure 1). Of note, for all four viruses analyzed, the "random pools" detected a slightly higher, statistically not significant total virus-specific response than the "protein pools". This is likely due to the presence of highly reactive epitopes which, when tested in the same peptide pool, can exceed the upper detection limit of the ELISpot assay and may thus underestimate the total virus-specific magnitude of responses. This may be more likely for epitopes in "peptide pools" than "random pools" if some proteins elicit generally stronger immune responses than others. A protein pool accumulating strongly reactive epitopes would result in fewer spots than the total of the respective "random pools" containing these epitopes equally distributed and fully quantitative. Comparable magnitude of responses detected by "protein" and "random" peptide pools: The magnitude of CTL responses was determined by adding magnitudes for all "protein" or "random" pools for each virus. Responses on the Y-axes represent the total of all virus specific "random pools", the X-axes indicate total responses detected using the "protein pools". Data from 12 HIV-, 19 EBV-, 14 CMV-, 9 HCV-infected individuals were tested against either set of peptide pools for A) HIV, B) HCV, C) EB V, and D) CMV and compared using the non-parametric Wilcoxon matched pairs test. In order to maximize cell use in samples with limited cell availability, we investigated whether cells from initial ELISpot matrix screens could be re-used in subsequent functional assays. Specifically, cells from wells that did not respond to peptides added in the first assay as well as the cells in the negative control wells may be used for secondary ELISpot assays. To assess the feasibility of this strategy, all wells from the initial ELISpot plate were transferred to a 96-well plate and incubated at 37°C with 5% CO2 while the ELISpot plate was developed. Cells from negative ELISpot wells were then used to confirm the identity of the epitope(s) targeted in the matrix peptide pools. In separate experiments, cells from initially positive wells were also tested in subsequent assays to determine if continuing IFN-γ production in these cells would prevent them from being used in further ELISpot assays. The analyses also compared ELISpot results in plates that were either undisturbed, or from which cells were transferred for later use. Representative RecyleSpot assays using PBMC and recovered cells from initial ELISpot assays from three individuals are shown in Figure 2. In all cases, negative wells from initial peptide matrix ELISpot assays were re-used to reconfirm the identity of the presumed, single targeted epitope shared by the two pools. Further, initially positive pools were re-tested to assess whether recycled cells responded with a different magnitude compared to the initial assay. The data show that sufficient cells were recovered from initial assays to perform reconfirmations of single targeted epitopes in the RecycleSpot, and that background activity and magnitude of responses were not significantly different between the first and the subsequent assays. RecycleSpot assays that used initially positive wells, or mixtures of initially positive and negative wells, showed high background in the secondary assay, indicating ongoing IFN-γ production and thus precluding these cells from use in the RecycleSpot (data not shown). No effects on the quality and the number of spots between the manipulated and non-manipulated wells were observed, indicating that harvesting cells from the ELISpot plate did not negatively interfere with the quality of the assay, at least when cells are removed by careful pipetting using a 12-channel pipetor Furthermore, RecycleSpot assays were performed using both fresh and frozen/thawed cells and showed that HIV-and EBV-specific responses were maintained in recycled cells in both cases (data not shown). Together, the data indicate that RecycleSpot can provide sufficient numbers of cells from initial assays and that these cells maintain functional capacity for use in subsequent assays, without raising background activity. Also, the data show that re-using the cells form negative wells after an overnight incubation did not reduce the magnitude of responses to a statistically significant level. RecycleSpot using recycled cells for the de-convolution of positive peptide pools: Wells of primary ELISpot and secondary RecycleSpot are shown. Line A shows the data from the initial ELISpot assay, including two positive wells indicating cellular response to EBV peptide pools, three negative and one positive control wells. Line B shows the same outline as in A, this time with recycled cells in a secondary ELISpot analysis and, one separate well, using the predicted targeted epitopes from the matrix analysis. The numbers indicate the spot forming cells per million PBMC. Even though rational optimal epitope matrix design and RecycleSpots may help in reducing the required cell numbers for in vitro analyses, cell availability may still be limiting in settings where only very small biological samples can be obtained. In such instances, investigators have resorted to the use of in vitro expanded cells [19, 20, 25]. However, despite its potential usefulness in situations of small sample size (e.g. tissue biopsies or small volume peripheral blood samples), relatively little is known on how in vitro expansion impacts magnitude and breadth of detectable responses [20, 25]. Furthermore, CTL responses to pathogens like HIV, for which a defect in their proliferative capacity has been shown, may be severely distorted by in vitro expansion, even when stimulated unspecifically . To address this issue and to investigate whether stimulation of PBMC with an anti-CD3 mAb (12F6) expands CTL of different specificity equally well, we tested cells either directly or after expansion against peptide sets of described HIV- and EBV-specific epitopes restricted by the individual's HLA alleles. These analyses included twelve subjects, of which seven were tested for responses to HIV and EBV epitopes, while the remaining five were tested for EBV-specific responses only (Figure 3). In vitro expansion of thawed cells increases the magnitude and breadth of HIV and EBV specific responses: Thawed PBMC from 12 individuals were tested against HIV and EBV peptide pools (n = 7 subjects) or against EBV peptide pools only (n = 5). Cells were used either directly after thawing or after thawing and a subsequent two-week in vitro expansion using the anti-CD3 mAb 12F6. A) The breadth of the detected responses (number of peptide pools reacting) and B) the total magnitude (sum of all positive peptide pools) is compared between the two cell preparation using the non-parametric Wilcoxon matched pairs test. C) PBMC from 5 EBV infected individuals were used either directly after isolation of after a two-week in vitro expansion or as frozen/thawed cells with and without in vitro expansion, and compared for the breadth (number of pools recognized) and D) total magnitude of the EBV specific responses. In a first analysis, frozen PBMC were either tested directly or after a 2-week stimulation using 12F6 and the number of targeted HIV or EBV epitopes were compared, resulting in 19 data points (seven individuals tested for HIV and EBV responses and five subjects tested for EBV-specific responses). Flow cytometry in nine individuals showed preferential expansion of CD8 T cells, as CD4 expressing T cells ranged between 0.5% and 14% only, independent of HIV infection and starting CD4 T cell counts (data not shown). The Elispot results revealed no difference in the breadth of responses (number of targeted epitopes) between the directly tested and the expanded cells, as a median of 6.4 and 6.9 positive responses were detected for HIV and EBV, respectively (Figure 3A). The recognition of HIV- and EBV-derived epitopes was equally frequent by the two different cell preparations (data not shown). When the magnitude of responses was compared between directly used and expanded cells, expanded cells responded with a slightly higher magnitude than unexpanded cells. This trend was more prominent when HIV and EBV responses were analyzed separately. 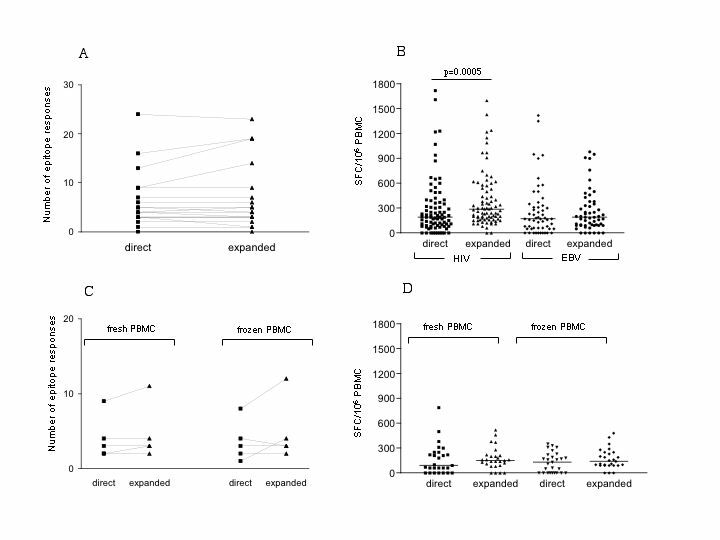 The HIV responses in directly tested cells showed a median of 185 SFC/106 PBMC, as compared to 285 SFC/106 PBMC in expanded cells (p = 0.0005); whereas the median EBV-specific responses had a magnitude of 170 SFC/106 in unexpanded PBMC compared to 190 SFC/106PBMC in expanded cells (p > NS). 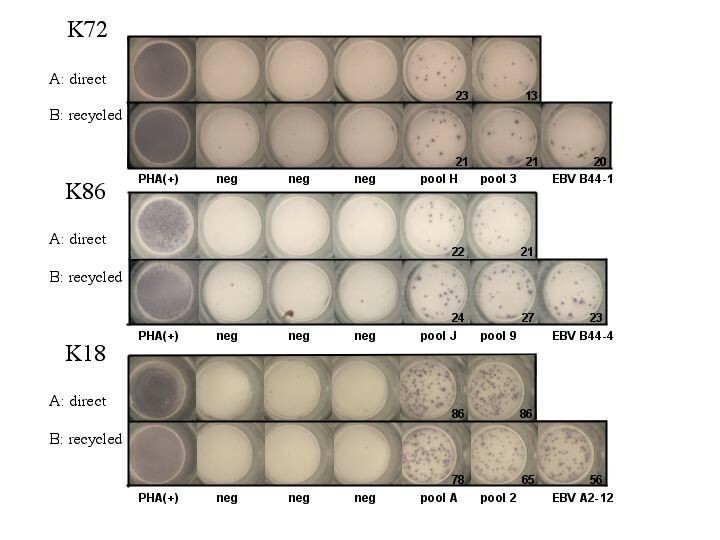 Moreover, to determine whether freshly isolated cells could also be expanded without drastic changes in their response patterns, PBMC from five EBV-infected subjects were tested directly after isolation, or after freezing, and with or without in vitro expansion. In agreement with the data from frozen samples, no significant difference in the number of pools targeted or the median magnitude of these responses was observed (Figure 3 C and 3 D). Despite concordance among the response patterns between the different cell preparations that was as low as 80%, the overall breadth and magnitude of these responses did not change. In addition, when comparing the magnitudes of the responses between each other, the relative magnitude of the responses was maintained between the four different cell preparations (data not shown). Combined, the data demonstrate that anti-CD3 expanded cells maintain their specificity and relative magnitudes when compared to unexpanded cells (both when used fresh or after thawing) indicating that in vitro expansion could be employed when the breadth, but not the absolute magnitude of responses, is being assessed. This was the case for the assessment of HIV- as well as the EBV-specific responses, suggesting that cells specific for HIV do not significantly differ from EBV specific cells in their ability to undergo in vitro expansion using a non-antigenic stimulus. Cell availability can severely hamper in vitro analyses of antigen specific immune responses, hence approaches which optimize cell use are urgently needed. This is especially true for assays requiring extensive sets of antigens to be tested while only a limited number of cells can be obtained. However, logistic considerations may prevent repetitive sample collection for larger trials, and re-use of fresh or frozen samples could provide more effective ways to perform necessary analyses. The present study introduces a novel approach by which some of the sample limitations can be overcome, and may prove helpful in routine laboratory tests that currently do not make optimal use of available cells. This may not only facilitate currently performed assays, but may open possibilities to expand analyses to simultaneous assessment of even larger sets of antigens and additional functional aspects. In the present study, we have designed and tested an approach that allows the assessment of the CTL mediated immunity against five different viral infections, including HIV, HCV, HBV, EBV and CMV. We provide an up-to-date listing of currently determined viral epitopes for which the minimal length and HLA restriction have been established. In the case of the small genome viruses HIV and HCV, these optimal epitopes represent a large portion of the respective immune targets . Although they do not include all responses detected in OLP screenings, our comparative analyses of HIV-specific responses from 100 individuals detected by either overlapping peptide (OLP) sets or optimal epitopes show that on average 68% of the observed OLP responses are covered by previously established HIV optimal epitopes (data not shown). The present data also show that PBMC recycled from negative wells from an ELISpot assay can be re-used for subsequent functional assays. Depending on the analyses performed in the subsequent assay, such as reconfirmation of single epitope responses predicted in the initial matrix analyses, relatively small numbers of cells maybe required. Thus, although individuals with broad responses in the initial ELISpot assay will not yield many negative wells from which to recycle cells, the wells with non-targeted peptide in addition to the negative control wells often provide sufficient quantities of recycled cells to complete the matrix based analyses. Since the responses in the RecycleSpot are not significantly diminished as compared to the initial assay (Figure 2), the magnitude of responses in the subsequent assay can still provide adequate data at the single epitope level. In vitro expanded cells have been used in a number of studies where cell availability has been the limiting factor[21, 22]. However, no study has directly compared for instance biopsy and PBMC-derived responses in a systematic manner and on a single epitope level, and it is unclear whether the in vitro expansion provides identical data. In the present report, we have compared the response patterns to EBV- and HIV-derived antigens in directly ex vivo and in vitro expanded PBMC preparations. No significant differences were observed, although some responses are lost or gained upon expansion. As no difference in the concordance between EBV- and HIV-specific responses was observed, the data indicate that responses to both viruses are equally well expandable in vitro using an antigen-unspecific stimulus, despite the ongoing viral replication in most HIV infected subjects tested here. Thus, optimal epitope matrices, RecycleSpot and in vitro expansion of cells can be combined to achieve maximal information on an extensive set of antigens, even if sample availability is limited. As a practical approach, expanded cells from frozen PBMC aliquots can be used initially to screen a large number of antigens to determine the approximate breadth of responses within the set of antigens used. Subsequent studies using unexpanded cells and antigen matrices in conjunction with RecycleSpot would then allow determination of the true breadth and, more importantly, the true magnitude of these responses while requiring minimal cell numbers. Furthermore, cells can be successfully recovered from the RecycleSpot once more to be used for genetic analyses such as HLA typing. This combined approach should facilitate future work in settings in which cell availability is of constant concern. This work was supported by a grant of the Swiss National Science Foundation to FKB (SNF-PBSKB-102686) and by the Solid Organ Transplantation in HIV: Multi-Side Study (AI052748) funded by the National Institute of Allergy and Infectious Diseases.